Tours depart at 14.00 and 15.30 daily throughout the year. From the end of March to November there is an additional tour at 9.00. During October there is no tour at 14.00. Summer season; views from the tower are clearer and the towers are unlikely to be closed due to extreme weather. We are comparing Fast Track Sagrada Familia with Towers Prices from leading ticket suppliers and Try to find you Cheap tickets prices on the market. Come inside the most iconic Roman Catholic Cathedral of its time, designed by renowned 19th century architected Antoni Gaudi, La Sagrada Familia is known for its mesmerising stone motifs, vibrant stain-glass windows, and tiles, art depicting the Holy Family and scenes of nature. To this day this world-famous Basilica remains unfinished, but you are still welcome to pay a visit, this mammoth project is estimated to be completed in 2026. During this combined skip the line guided tour of La Sagrada Familia with access to the towers you will benefit from the best price, time-saving entry, and the extensive knowledge of your personal tour guide. Let yourself become emerged in the rich cultural history and art within the Cathedral, your guide will provide a full description and show you through the Gaudi Museum, where you will discover the works and life of Barcelona's favourite architect and see original plans for La Sagrada Familia. The highlight of this tour is inclusive access to the Cathedrals towers, ride the elevator to the top to enjoy spectacular views of the city. Take your panoramic pictures, snap some selfies and enjoy the breeze at your own pace before descending on a long spiral staircase. This guided tour of La Sagrada Familia is great for art and history enthusiasts, this is one of the most unique Roman Catholic Cathedral to exist in Europe. Also ideal for visitors looking for a comprehensive but not time-consuming tour. Your Experience With Fast Track Sagrada Familia with Towers? Visit the most famous landmark of Barcelona and highlight of Antoni Gaudi's career, the Basilica de la Sagrada Familia. Learn the stories and facts behind this ongoing construction on a comprehensive tour with a qualified art historian guide. 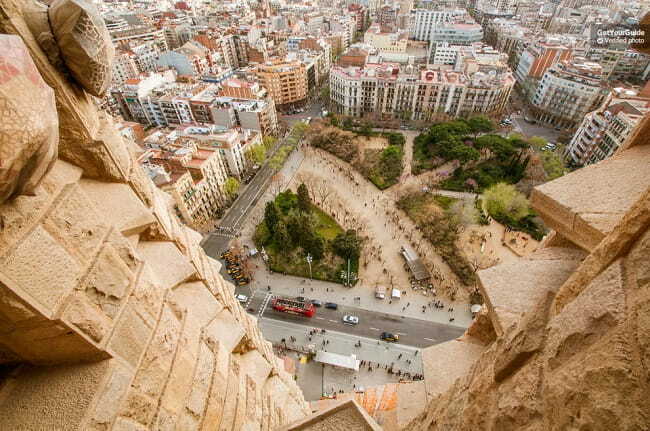 Ride the elevator to the top of the Cathedrals towers and see the city from a bird's eye view. Take advantage of great prices and convenient tickets with a combination skip the line with guided you AND entrance to towers ticket. What Fast Track Sagrada Familia with Towers Includes? Priority skip the line entrance to La Sagrada Familia. Admission fees for the Cathedral and its towers. 1.5-2 hour guided walking tour of the Basilica. Professional bilingual guide (English, Spanish, French and German). This is arguably the most popular attraction in the city and therefore tickets to this tour might be limited during the peak season and national holidays. If you want to visit during these times then we recommend booking in advance. Travelers Reviews about Fast Track Sagrada Familia with Towers? This tour has an overall 4-star rating on both TripAdvisor and Viator. Get Your Guide users have given this tour a higher rating of 4.5. Travellers say that the guides are fantastic and the cathedral is magnificent. Some travellers say that if you are not interested in architecture or history then this tour is too long. Electronic or paper tickets are accepted, please show to your guide. Ticket policies vary, some are non-refundable but most are fully refundable up to 7 days prior to scheduled tour, partial refunds may be available if cancellation is made less than 7 days in advance. Please check cancellation policies before making your reservation. Please wear sensible shoes, to visit the tower you will ascent by elevator but you must decent via the stone staircase (except disabled visitors). To enter the cathedral all visitors, both women and men, must be wearing clothing which fully covers the shoulders and knees, as La Sagrada Familia is a religious site and entrance can be denied to anyone dressed inappropriately. In this case a refund will not be issues. Children under 6 are not allowed to visit the tower. Towers may be closed for safety reasons in the event of severe weather. Meeting Point: Near La Sagrada Familia Cathedral, Central Barcelona. Exact location will be in the booking confirmation.